Most of the basic components used here are commonly available from Electronics stores such as Maplin Electronics and Farnell. 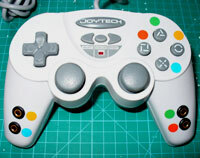 The JoyTech controllers are available by e-mailing OneSwitch and sell for £15 each. 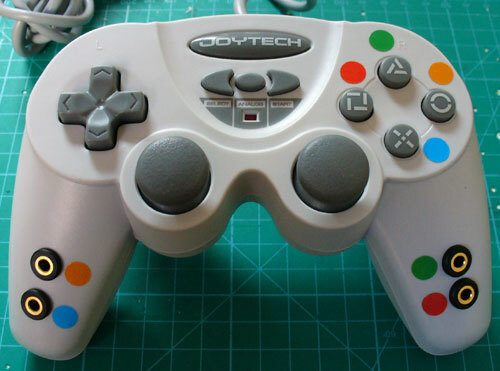 N.B.Not all joypads can be adapted in this way as many use analogue push buttons. 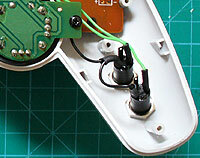 Wiring into such buttons will lead to the extra resistance in your switch wire leading to likely problems. For instance, you may find that pressing your switch in the likes of Grand Theft Auto has your car driving very slowly or even not at all. 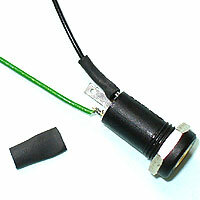 Soldering iron (15 to 30 Watt power); thin solder; soldering flux; de soldering braid; thin wire (e.g. 10 strand 0.1mm), Shrink Wrap (optional). Cordless drill with 1mm and 7.5 mm drill bit; Knife or wire strippers; small screwdriver set; Needle nose pliers; Small hot glue gun and or cable tidies (optional). 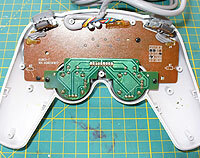 Flip the joy pad over and remove the 7 screws. Sellotape over shoulder buttons to hold them in place then remove the back casing. Unscrew both rumble motors then cut them off the PCB. 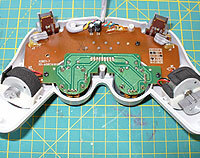 Next you'll need to unscrew then remove the circuit boards from the joypad housing. Remove the rumble motors to make space for four switch sockets. Drill holes for the switch sockets then fit them. 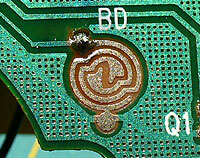 Drill five holes in the brown PCB as detailed below. Loom the black ground wire into each of the four sockets. Connect the remaining four wires to their respective socket. Reassemble. Play! Carefully drill five holes as encircled in red and black in the image to the left. Carefully scratch directly around your drilling point to expose the copper tracks. 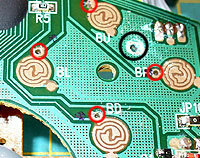 The red holes are where your sockets will connect directly to the shape button contacts of the PCB. The black hole is the common (aka 'ground') point which will be shared by all four sockets. Very carefully solder wires to each of these new holes as pictured. 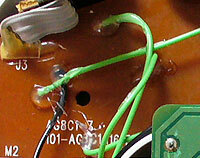 Ensure that your soldering does not cross tracks as this will cause a short-circuit. 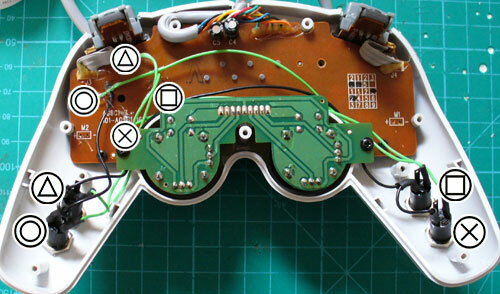 At this point you can make a quick test by touching the trailing ground wire to one of the shape button wires when connected to a Playstation. If all seems well then it's a good idea to hot glue the points where the new wiring threads through the rear of the PCB. This will better secure the wiring. Drill 7.5mm holes for your sockets. 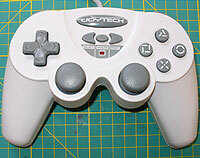 I have used four here which is the comfortable limit for this controller. Screw these sockets into place then wire them up. Use the image at step 3 above to guide you. Heat-shrink these if you wish to add strength and to insulate. The black wiring is the ground loom. Simply link each socket together at the same point all the way back to the ground point you drilled on the PCB. Carefully reassemble making sure that you don't snag any loose wires. Test then perhaps use coloured stickers to colour code your sockets. The fun bit (if it all works) is play-testing.